Print : Will BlackBerry Be Sold for Parts? It has been well over a month since BlackBerry formally put itself up for sale, but interest in the much-diminished smartphone pioneer has been muted. Sources close to BlackBerry tell Reuters that a handful of companies are kicking the company’s tires, reviewing its financials and assets as they weigh the merits of a possible acquisition. But few, it seems, care to buy the company outright. Of the private equity firms eyeballing BlackBerry recently, most appear to be interested in pieces of its business. They see the company’s patent portfolio and its secure messaging platform, BlackBerry Messenger, as potentially attractive assets — if they’re carved out or otherwise freed from BlackBerry’s floundering handset business. As AllThingsD reported earlier this year, BlackBerry’s patents are likely to be worth somewhere between $2 billion and $5 billion, depending on whether they’re bought by a lone acquirer or purchased by a consortium of companies in some sort of cross-licensing deal. Analysts have estimated the company’s services and secure-messaging business to be worth $3 billion to $4.5 billion. Taken together with BlackBerry’s $3.1 billion in cash and investments, that’s a tidy sum — far more than BlackBerry’s current $5.374 billion market value, even at the low end. 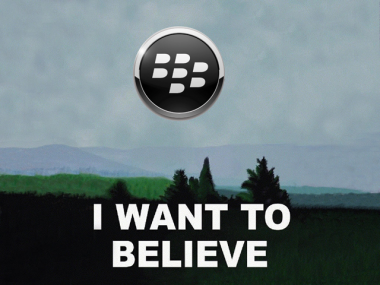 But, given these rumblings of tepid interest in BlackBerry, who would pay that? Particularly now, ahead of a November quarter that’s likely to be pretty bad. Wait for the end of the year, and you may get a better price. Dismal news for BlackBerry. Unless Prem Watsa’s Fairfax Financial can orchestrate a deal to take the smartphone pioneer private, BlackBerry’s days as a standalone public company may soon be over. Fairfax Financial did not respond to a request for comment. BlackBerry declined to provide one. Return to: Will BlackBerry Be Sold for Parts?